The original Magwell Grip! Often imitated, never rivaled! 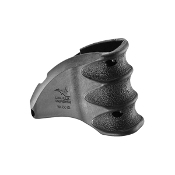 The MWG converts the magazine well into a comfortable vertical grip for better control of the weapon. Allows a tight stance for speed and maneuverability. Prevents pressure on non-free-floating handguards that can affect accuracy. Keeps hands off the magazine. The MWG also functions as a flared and extended magazine well to speed reloads. Has a window to view your serial number through. Fits MIL-SPEC M16, M4 and AR-15 lowers. The MWG is also legal on AR pistols.